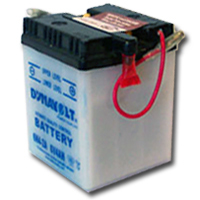 6v conventional motorcycle batteries can usually be distinguished by a row of plastic stoppers in the top (3 stoppers in a 6 volt battery and 6 stoppers in a 12 volt battery). Lead acid batteries usually have higher and lower battery acid levels on the front and have a white/clear plastic lower casing. 6v conventional or lead acid type motorcycle batteries reference numbers usually start with the prefix 6N (e.g 6N4-2A) or B (e.g B39-6).